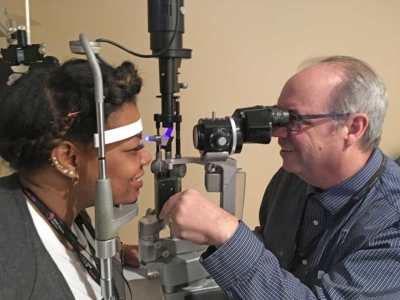 Dr. Vincent Parsons, right, demonstrates a glaucoma screening on Norma Owens. Norma is an optometric assistant at Swope Health. January is the month designated to raise awareness of glaucoma, one of the leading causes of vision loss and blindness. Seeing that clean, new calendar makes it a good time to schedule an eye exam and learn more about taking care of your eyes. At Swope Health, you can call for an appointment with our optical team at 816-923-5800. More than 3 million people in the U.S. have glaucoma. Half of the people who have it don’t know they have it. Glaucoma is usually associated with seniors who are age 60 or older, but it can affect anyone at any age. Glaucoma is the leading cause of blindness in African Americans. It’s also prevalent in Hispanic populations. There is no cure for glaucoma, but early identification can slow the progress of the disease. According to the National Eye Institute, glaucoma actually refers to a group of diseases that affect the optic nerve in the eye. The optic nerve, a bundle of more than a million nerve fibers, connects the retina of the eye with the brain. The disease is detected through a visual field test, to see if you have lost side vision or peripheral vision. The optometrist also will use a magnifying glass to look for damage to the optic nerve. Finally, the optometrist will use eye drops to numb your eyes, and perform a test to measure your eye pressure and determine the thickness of your cornea. If you are diagnosed with glaucoma, you may be treated with medicines to lower the pressure in the eyes. These medicines may be in the form of eye drops or pills, and need to be taken regularly to be effective in preventing the disease from progressing. In some cases, surgery is recommended to lower pressure in the eyes. In advanced or very advanced stages of glaucoma, you gradually lose your peripheral vision – it appears as if you are looking through a tunnel. The Center for Disease Control and Prevention estimates that the number of blind and visually impaired people in the U.S. will double by 2030 as the population ages. Taking care of vision health with a visit to the optometrist can help reduce that number and improve health, wellness and quality of life. Why wait? Start now with an eye exam: call 816-923-5800 to schedule an appointment. 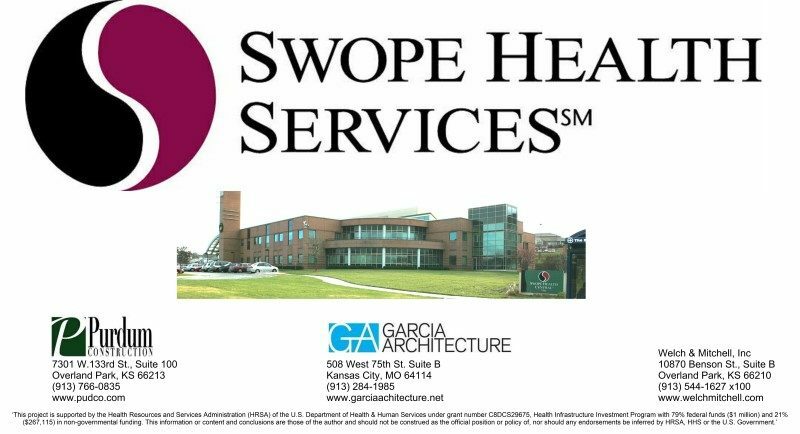 Swope Health Services has launched a state-of-the-art sterile processing area at Central and Wyandotte locations. 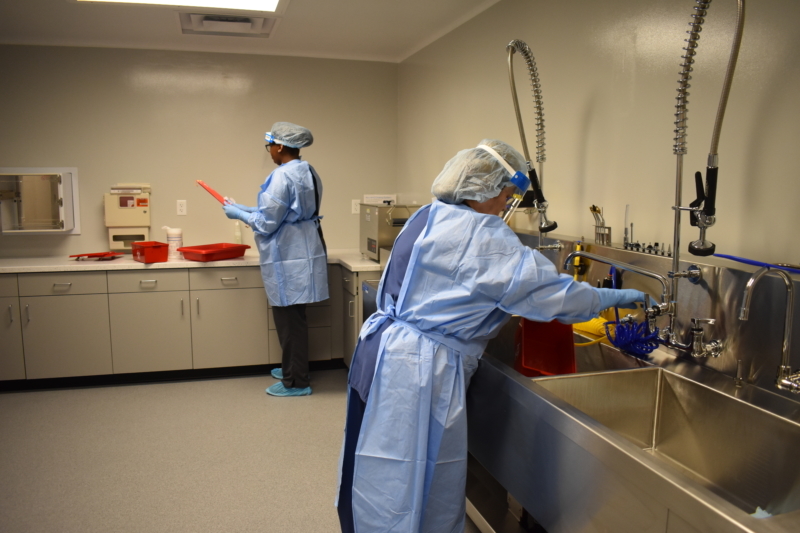 The new Sterile Processing department is similar to centers housed in large hospitals. The purpose is to assure patient safety in the decontamination of all reusable instruments used in medical and dental procedures. “We’re raising the bar for community health centers,” said Debbie Meads, program manager, who directed the construction of the department. The project involved changes to the Central clinic environment, water and air handling, as well as to the transportation and storage of instruments. 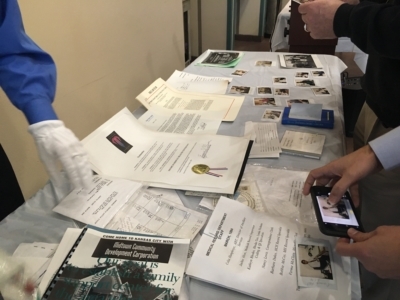 The project also included an education plan for all associates who work with reusable instruments and special training for about 10 associates in proper disinfection and sterilization of reusable instruments. These associates now serve as sterilization processing technicians. 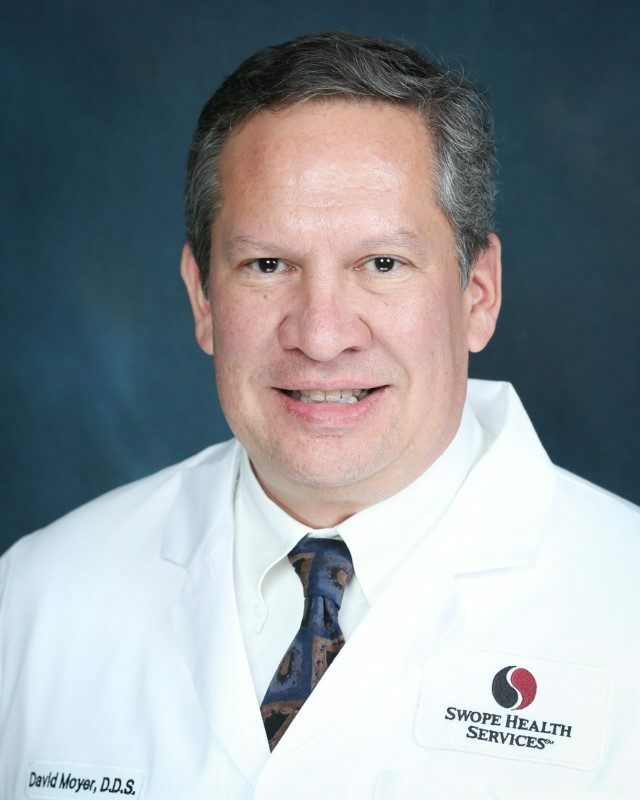 “Other than handwashing, sterilization is the next most important thing to consider in infection control,” said Kenneth Thomas, M.D., Chief Medical Officer and a practicing pediatrician. Prior to the development of the Sterile Processing areas, equipment was sterilized in autoclaves or small steam chambers in various clinics. 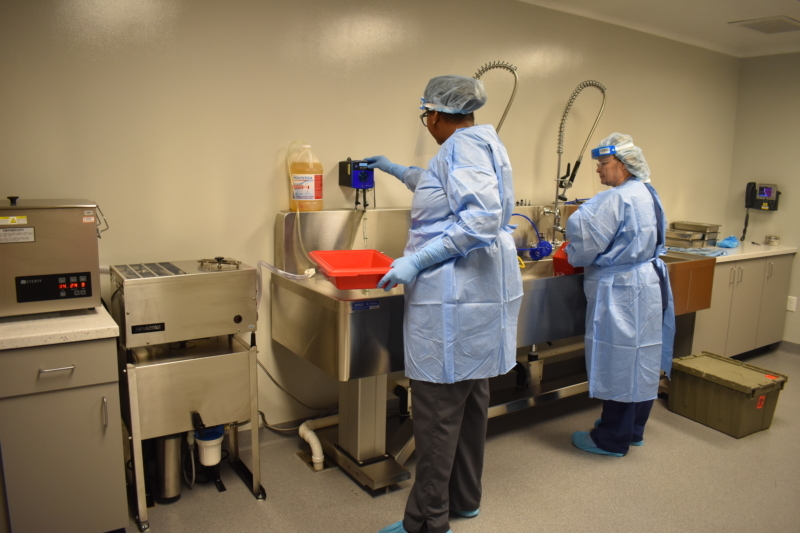 The new department creates greater efficiency and assures consistent practice in the decontamination and sterilization of all materials, under the same standards, every day. 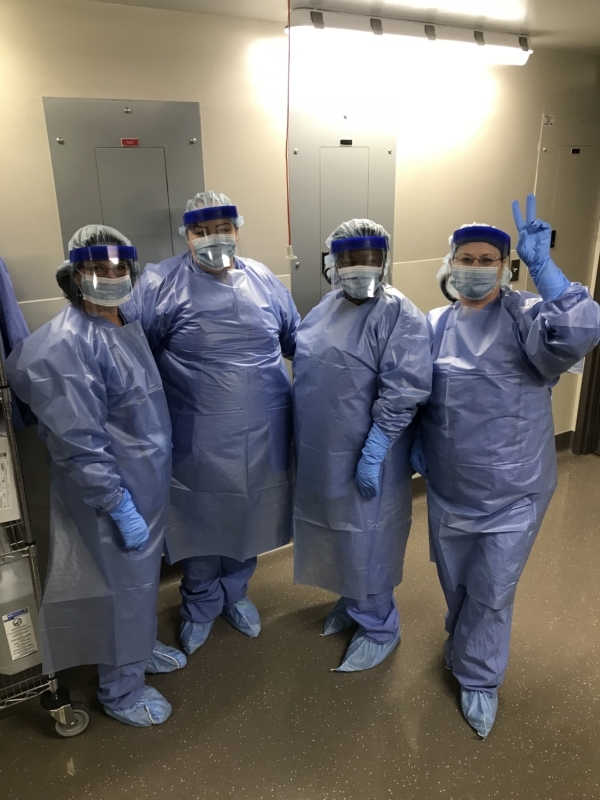 A peek inside the new Sterile Processing Department on the second floor at SHS Central where, from left, Jaleeah Jones and Flora Wooster, Sterile Processing Technicians, are preparing reusable instruments for sterilization. This is a special room with its own heating, cooling and ventilation system. It is pressure-controlled, with special air exchange capability to completely exchange all the air in the room 10 times an hour, 24 hours a day. This secure room with these special capabilities assures that no contamination – pathogens or germs – can enter or escape from the processing units. Coming to SHS for the first time? Here’s what you need to know. Melanie Evans, Director of Assurance, manages the Registration operations at Swope Health Services. Registration is on the first floor at SHS Central, straight ahead as you come in the main entrance. 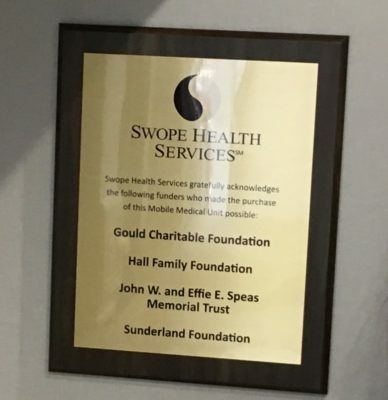 If you are planning to visit Swope Health Services for the first time, here are a few tips to make your visit as convenient as possible. On your first visit, bring along a government-issued photo identification, like a driver’s license or passport. Also bring any insurance and proof of income or employment, such as a check stub from an employer or social security or pension, tax record, or unemployment benefit letter. And plan on filling out several forms with basic information – your date of birth, address, phone numbers, emergency contact information. Why do we ask? SHS is a federally qualified health center, operating under federal grants, which means we have to provide specific reports to the federal government about the care we provide. We gather this registration information once a year from all patients to satisfy our operating grant requirements. We also provide services on a sliding-fee scale. We look at several factors, including income, to determine if your fees could be reduced or waived. If we don’t have that information, you can still get services but you may be 100 percent financially responsible for it. If you forget any of this information, we’ll ask you to provide it within 30 days. For your first time here, completing all the registration paperwork usually takes about 25 minutes. If you’ve registered before, it rarely takes more than 10 minutes. On follow-up visits after you register, we verify your address, phone number, insurance and date of birth. 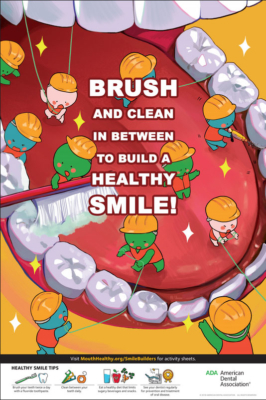 We charge a $25 service fee for medical care, and a $45 service fee for dental care. There’s also a $10 service fee for children’s medical care and a $20 service fee for children’s dental care. There can be additional charges for other services such as lab work or procedures. We will accept whatever you can pay and will work with you on payment plans. Bring medical records and medications. Here are members of the SHS registration team at the Central registration desk standing by to welcome you! From left, Sherron Hubbard, Lena Adams, Chiquata “Gladys” Harris, Debra Law, Jaimela Clemons and Tamika Robinson. Visiting for the first time means you should be prepared to talk about your health history with the clinical care team. They will ask about all the medications you take, allergies, illnesses or chronic issues and even your family’s history of diseases. Sometimes it easy to bring your medications along with you. If you can’t bring them, consider making a list or taking a mobile phone photo of each medication bottle. Be prepared to show these photos to your provider during your visit. It is also helpful to bring records of any recent hospitalizations or other medical attention. For kids, remember to bring immunization records, too. Let us know if you can’t make it. 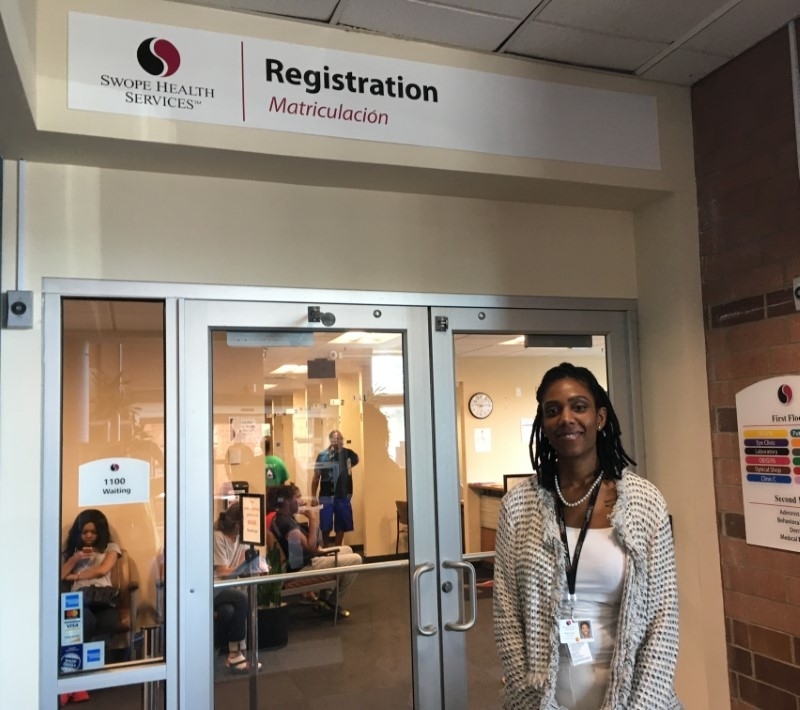 When you register at SHS, we ask you to sign an agreement that you will keep your appointments or provide at least a 24-hour notice when you can’t make an appointment. If you call to cancel, you can reschedule your appointment or come in for walk-in service. The SHS Wyandotte Clinic, SHS Central Adult Medicine and Outreach clinics all have “open access” scheduling – which means you can take the next available open appointment whenever you come in. In OBGYN and Pediatrics clinics, some time slots are reserved for walk-ins with acute needs only. Services like physicals and procedures always require scheduled appointments in OBGYN and Pediatrics. If you miss three appointments in 12 months, you may have to accept service on a walk-in basis only. We do this to respect our clients and providers. 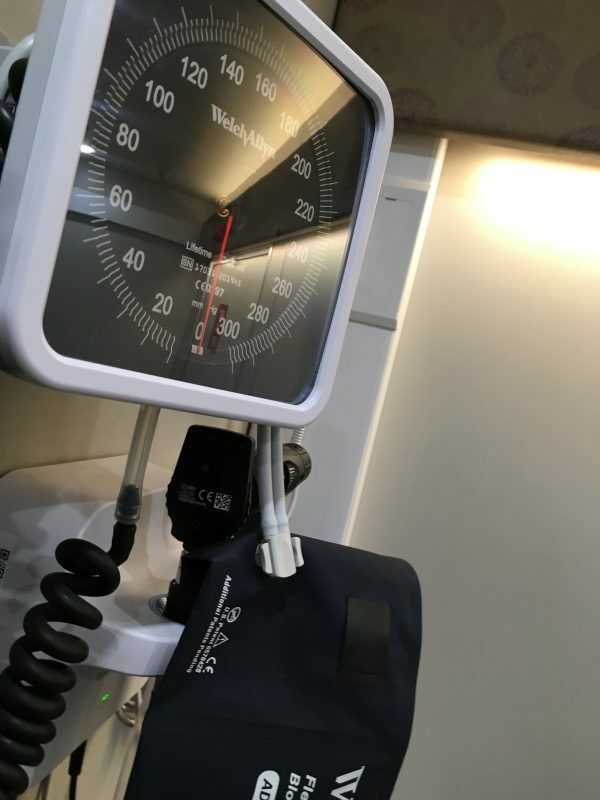 We know that you are busy, and we want to operate as efficiently as possible to be able to provide care to as many people as we can. Do you have other questions about registering? You can also call us at 816-923-5800 or leave a comment below. We look forward to serving you. 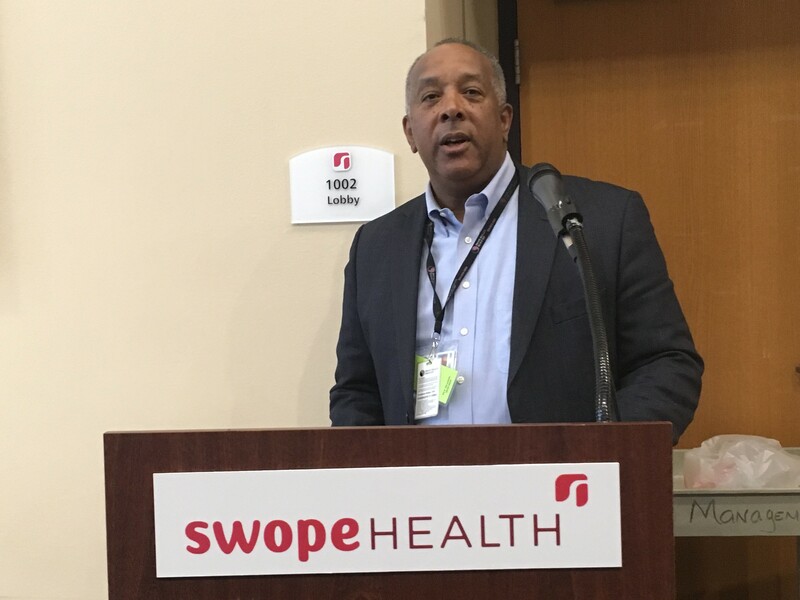 https://www.swopehealth.org/wp-content/uploads/2018/07/IMG_1301-Custom.jpg 600 800 Swope Health http://www.swopehealth.org/wp-content/uploads/2018/11/swope-logo-rev-750.png Swope Health2018-07-22 16:45:582018-07-22 16:45:58Coming to SHS for the first time? Here’s what you need to know. 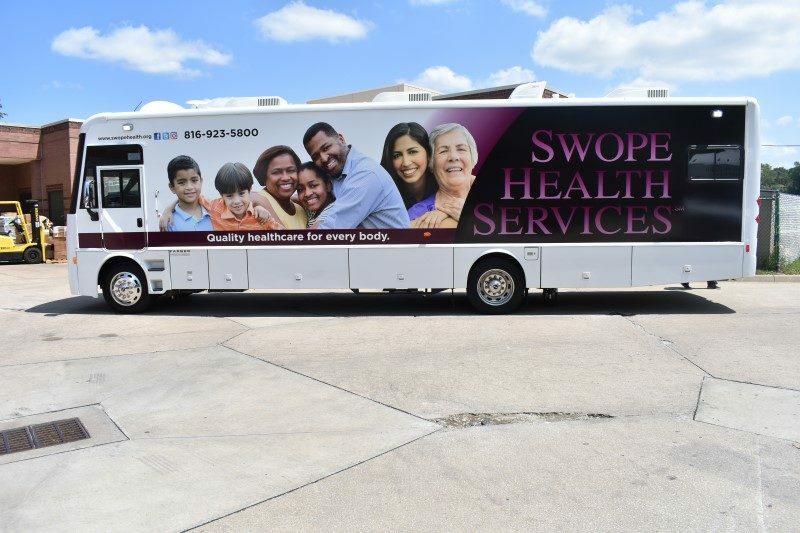 Amy Warren is a regular provider on the Swope Health Services Mobile Medical Unit (MMU), which visits shelters and other locations to serve the homeless population of the Kansas City area. Amy, a nurse practitioner, says it’s important to meet her patients wherever they are. Amy’s focus on providing for the indigent was nurtured during her tenure at Frontier Nursing University, located in rural Hyden, Kentucky. The school is best known for its focus on midwifery and serving women and children’s healthcare needs in the rural Appalachian foothills. 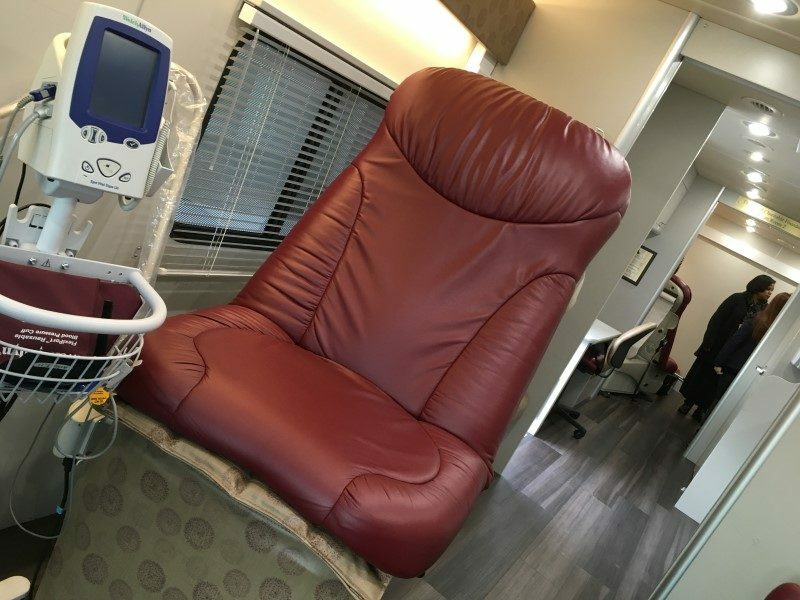 Thanks to generous donors, the Mobile Medical Unit is fitted with medical equipment and exam rooms to provide healthcare at any location. In the early days of the school (1939), the area had the highest infant mortality rate in the nation. With the school’s midwives, who traveled on horseback to remote hamlets and villages and provided basic primary care, the women and children began to thrive. The model of taking care to the community has been a hallmark of the school’s programs ever since. The Swope Health MMU is a little bit like today’s version of the horseback provider, venturing out to places where healthcare is needed but hard to get. And Amy is convinced the MMU can produce the same kind of impact today in Kansas City as her alma mater did nearly 80 years ago in Kentucky. Amy, with more than 20 years’ experience with Research Medical Center, works Tuesdays on the MMU and the remainder in the Outreach clinic. This MMU, by the way, is a new addition to the SHS Outreach Services fleet. 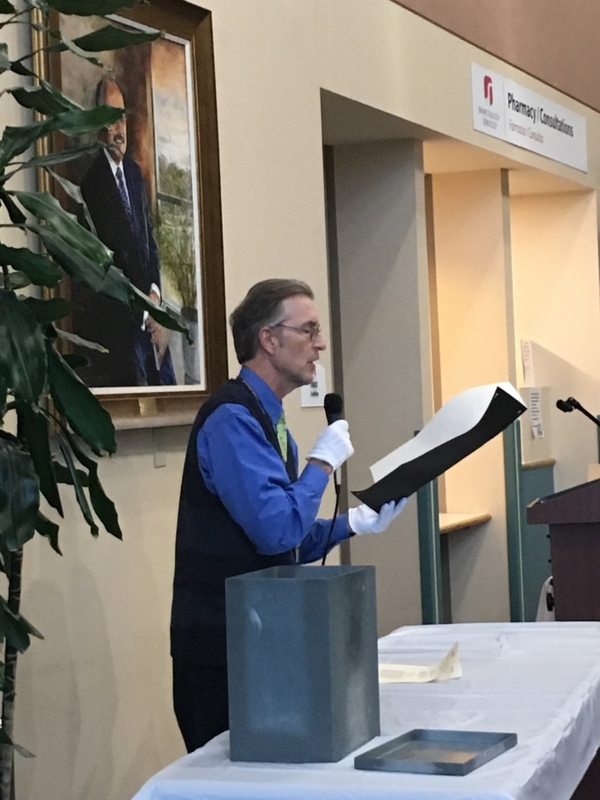 Delivered in the summer of 2017, the MMU was funded with the generous support of Gould Charitable Foundation, Hall Family Foundation, John W. and Effie E. Speas Memorial Trust and the Sunderland Foundation. WOW…She’s Been Helping Women at SHS for 40 Years! 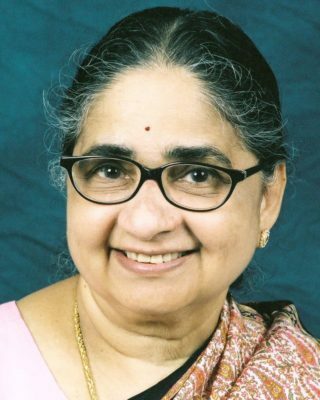 With 40 years of service, Dhana Rengachary, M.D., is a fixture in Swope Health Services Women’s Health Care. While she can’t say how many babies she has delivered or how many women she has cared for, she has patients who have brought daughters and now granddaughters to see her for their obstetric and gynecological care. She has tremendous recall of names and faces, which often astonishes her patients when she asks about family members and long-ago connections. “Connection” is important to Dr. Rengachary. 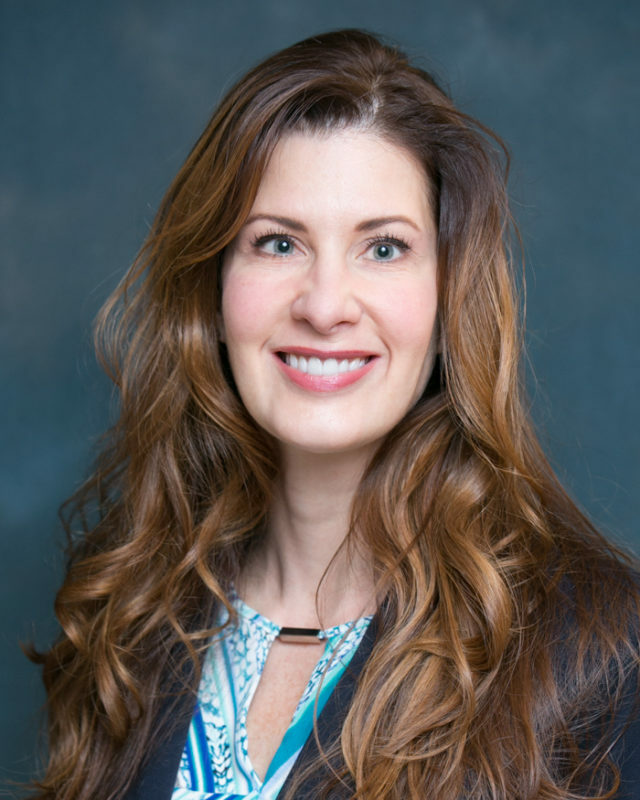 She invests her time and energy in making connections with her patients, in special ways that work for her. She arrives early to review the charts and records of the patients she will see each day. That way, when she is in the exam room, she avoids the distraction of using the computer. 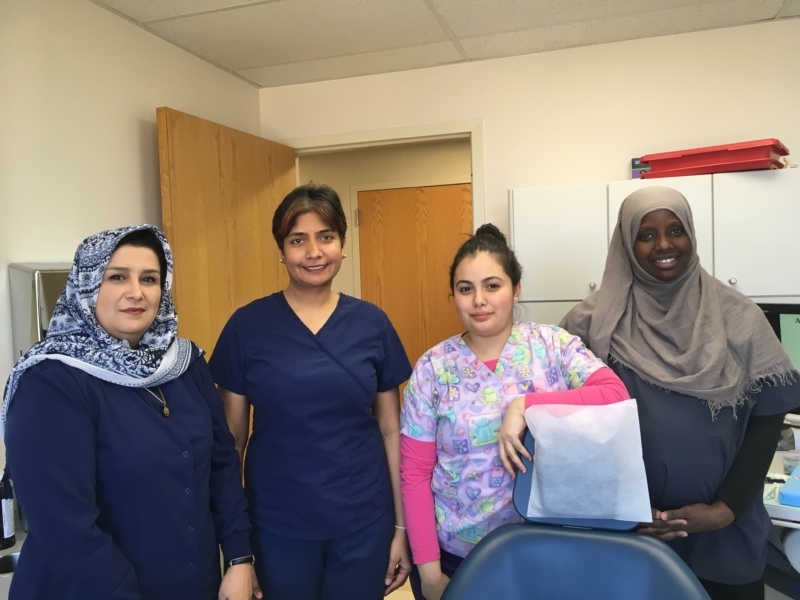 Her focus remains on her patient and making sure she is listening – connecting – with each person. Talking to Dr. Rengachary is a bit like visiting with a friendly grandmother. You feel the focus of her attention, and she is always smiling and happy to see you. She asks questions and listens carefully, then offers her own direct views, often with a story of her own experience. It is her special way of developing a bond with her patients. These days, she finds herself frequently encouraging patients to make time to take care of themselves. She sees the pattern of women putting a focus on children and family for years, and then caring for their own parents in later years. 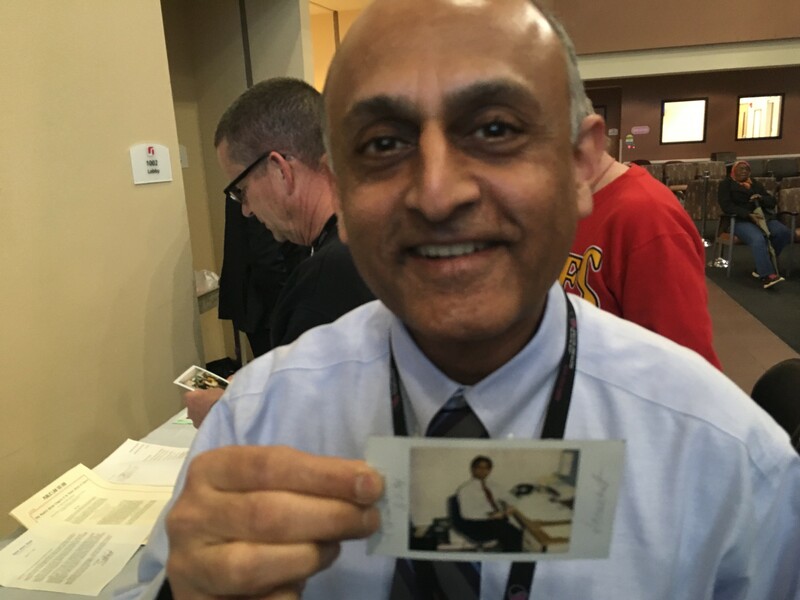 For Dr. Rengachary, her own life is inextricably tied to Swope Health Services. She is proud of the care SHS offers, and she speaks as both a caregiver and a patient. Dr. Rengachary tells her patients she uses SHS for her own medical, dental and optometry care. When colleagues ask for advice, she says there are three things you need for a good practice: Availability, Amicability and Ability. Amicability – She is approachable and friendly, showing her patients she cares for them. Ability – She brings her medical training and experience to care for every patient. But her main philosophy is much simpler and can apply to everyone. “Put your heart into your work,” she said. We encourage you to take Dr. Rengachary’s advice and make time to visit your doctor. Call us to schedule an appointment: (816) 923-5800.
https://www.swopehealth.org/wp-content/uploads/2017/05/Dhana-Rengachary.jpg 800 640 Swope Health http://www.swopehealth.org/wp-content/uploads/2018/11/swope-logo-rev-750.png Swope Health2017-05-30 06:00:502017-05-22 10:25:07WOW...She's Been Helping Women at SHS for 40 Years! 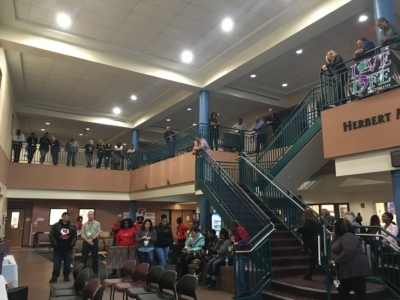 The National Association of Social Workers has named March as Social Work Month, giving us all a chance to recognize and applaud the services of social work professionals. Given how broad the term “social work” is, we thought this would be a good time to learn more about the role some social workers play here at SHS. 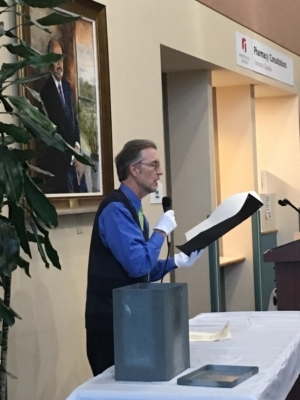 The “blessing” is the wide range of opportunity areas for social work: healthcare, mental health, government, military, schools, universities, social service agencies, community organizations. The “curse” is in that same broad variety of services, making it hard to quickly define the field of social work. What are those services? It could be therapy and healthcare, housing and transportation resources, training and education. Social workers help people who are experiencing illnesses or mental health crises; suffering abuse, neglect or trauma; or facing poverty and other roadblocks to daily living. Social workers’ services are covered by insurance, Medicaid and state and county programs. Josette Mitchell, Director of Adult Community Services, notes that a big part of the job is advocacy. That can mean making sure the policies and procedures meet the needs of the clients, including weighing in on state and federal programs and providing feedback to legislators and policy makers. Other times, advocacy can mean going to bat for a specific client – perhaps seeking appropriate medication or helping gain access to needed services. It can involve teaching, coaching and consultations, to help clients build their own toolbox of skills and resources, added Kortney. Social workers obtain extensive education and training, Josette notes. They are licensed by the state and credentialed by the National Association of Social Workers Credentialing Center. Social workers are required to participate in 30 hours of continuing education every two years to maintain credentials in Missouri. 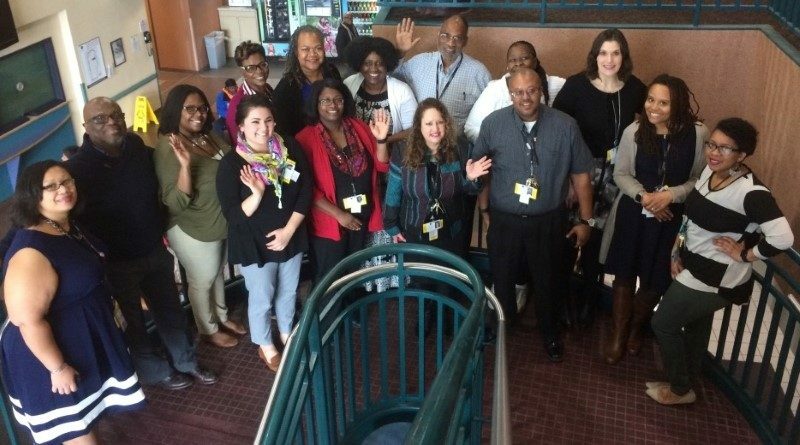 There are about 50 social workers at SHS and more than 650,000 across the U.S. By standing up for the vulnerable, social workers play an important role in creating healthy communities. In this month for recognition of social work, we invite you to join us in applauding, appreciating and thanking social workers. 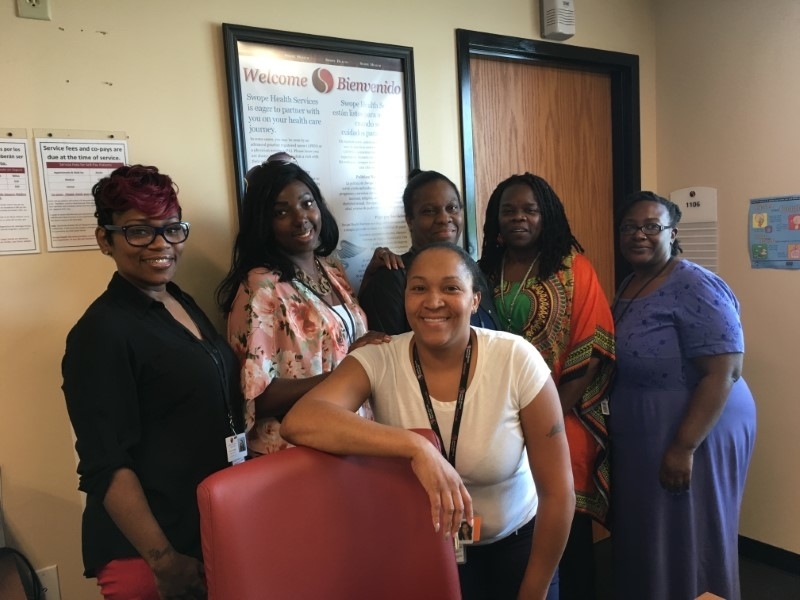 At SHS, our professional social workers support clients in behavioral health, pediatrics, OB/GYN, outreach, homeless outreach, residential services and Imani House departments. 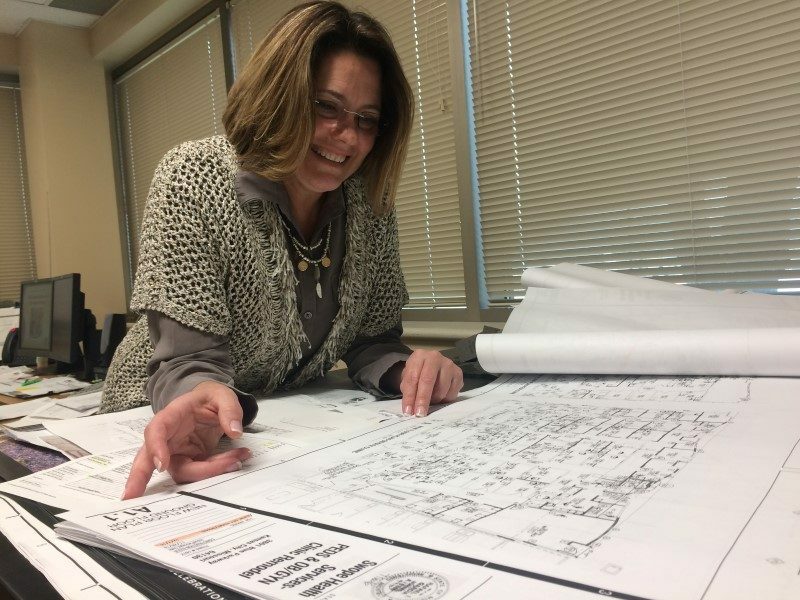 Debbie Meads, SHS Program Manager, checks details on blueprints for the renovations at SHS Central. Did you notice? Last year was a time of many changes at Swope Health Services, including refreshing many clinic lobbies with paint, flooring and new seating. And the dust hasn’t quite settled yet! The renovations and changes are part of a two-year plan, launched in 2016, as part of a $1.26 million grant from the U.S. Health Resources and Services Administration. Debbie Meads, Program Manager at SHS, keeps close tabs on all the moving pieces. At any given time, she’s shifting one department, demolishing another, while renovating elsewhere. She juggles the departments to keep services intact throughout the construction to improve our facilities and capabilities. Part of the effort involves creative use of limited space, she said. For example, SHS has adopted the practice of using open seating, which allows staff members to use any available workspace. Staff members have private lockers for storing personal items, but are free to use office space or open suites for meetings with patients or colleagues. Shared space opens up possibilities for more clinic exam rooms and more patient services, she noted. Providers also get new breakrooms and lounges in certain areas. The most significant changes will be in the OB/Gyn and Pediatrics area, to support patient needs. The SHS Central OB/Gyn department will increase to 25 treatment rooms, from 10 today, she said. Pediatrics will grow to 13 rooms from 11 today. These changes will be complete in 2017. Outreach, Infection Control, Health Care Home, and the new Smoking Cessation program offices moved to newly renovated offices in Building C and on the second floor. Blue Clinic medical staff will move from their west side offices to newly renovated space on the east side of the clinic. Adult Health Services, formerly identified as Yellow and Green clinics, will be merged into space that’s next up for renovation. The renovation and moves are scheduled to be complete in March. Once that’s complete, the former Green clinic space will be modified into the new OB/Gyn expansion. The renovations also converted a former staff conference and training room into a new Specialty Clinic. It’s all part of the plan to keep SHS growing to meet your needs. Watch for new signs and additional changes coming to SHS Central. Despite the changes, we’re open for service as usual. Call 816-923-5800 to schedule your visit.